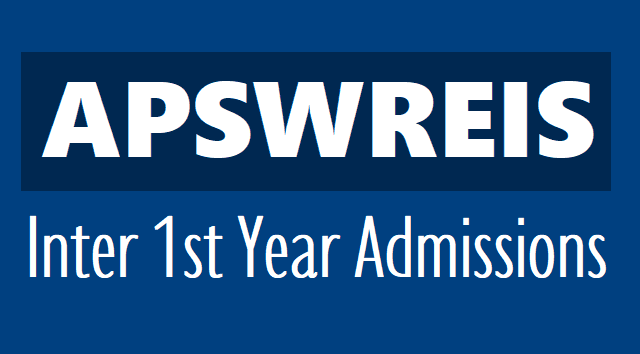 APSWREIS Inter 1st Year Entrance Test 2019 AP Social Welfare 1st year Intermediate Notification: Andhra Pradesh Social Welfare Residential Educational Institutions Society has given the APSWRIES RJC Entrance Test notification and would invite the online applications form Boys and Girls for admissions into 1st year intermediate MPC, BPC, MEC, HEC and CEC with English as the medium of instruction for the academic year 2019-2020 in the APSWR institution under the control of APSWREI Society. a) The students who are appearing for SSC exam in March/April , 2019 are eligible for submitting their applications online. However, their final seat allotment will be subject to their clearing the examination in the first attempt. b) If the group desired by the student is not available in the same district, the student can apply in another district of the same Zone. c) The students should apply within his/her own district. d) Students who studied Telugu Medium in 10th Class are also eligible to apply in English Medium Colleges. e) Boys have to apply in Boys Colleges and Girls have to apply in Girls Colleges only. 1. Out of 87% [75% for SCs and 12% SC converted Christians], 75% of seats are reserved for the students who have studied in APSWR Institutions and SW Hostels, remaining 25% seats will be given to open competition among SC students including SC converted Christians. 2. For 13% Quota meant for ST(6%), BC(5%) and OC(2%), 75% of seats are reserved for the students who have studied in APSWR Institutions and SW Hostels, remaining 25% seats will be given to open competition among ST,BC & OC Students. 3. 3% of overall seats will be reserved for the Physically challenged children who can attend their work without anybody’s help, based on the certificate issued by the Medical Board. 5. Orphans/destitute in the age which is appropriate to class applied in Residential Schools / Residential Jr. Colleges will be given seats irrespective of their performance in the examination. (as per G.O.Ms.No.47, Dated 31.08.2010 of women & Child welfare Department). 6. 3% of the seats in each category are to be earmarked for the wards of SAFAI KARAMCHARIS. 1. Process for admission into: The applicant can submit his / her application through ONLINE visiting website http://jnanabhumi.ap.gov.in. http://apgpcet.apcfss.in/Inter/ . There is no registration fee for submission of application through ONLINE. 3. The candidates are advised to collect Hall ticket duly downloading immediately after submission of application through online. b) Admission test will be held in the subjects’ viz., Telugu, English, Mathematics and Science and Social based on the State Syllabus of class X of A.P. State Government. c) The questions will be in objective type (Multiple Choice Questions) and will be in English/Telugu Medium. Test will be conducted in the selected centers of the district. d) The students may choose any one of the centers as per their convenience in the State. 1. The test will be based on the syllabus of class VIII to SSC standard in Mathematics/Biology and Physical Science subjects. 3. The entrance test question paper will be in bilingual (i.e., in English and Telugu Media). 4. Applicants can select any language as medium of writing the Test. In all these institutions English will be the Medium of Instruction. 2. Last date for submission of filled in applications through ONLINE is : 18.04.2019.